Introduction: In addition to nuclear power, this blog focuses on the electrification of the transportation system. Much of the story lies in the future. I share with with Joseph Romm a beliefe in that plug in electrical cars are very much the wave of the future. I have been following the ZENN Motor-EEStor story for some time. Either the two companies are about to produce a revolutionary car, or EEStor is engaged in a big time fraud. EEStor's contract with Lockheed- Martin appears to lend some credibility to the claim that EEStor has invented a revolutionary new ultra-capacitor technology. However, it is unclear if Lockheed- Martin actually was able to test an EEStor unit. ZENN is claiming "a single-charge range of 200 to 400 miles" with EEStor ultra-capacitor technology. I must admit that there are aspects of the EEStor story that I find hard to accept. A discussion on Tyler Hamilton's blog vertainly raises some red flags. A post Lockheed discussion on Tylor's blog continues to raise EEStor issues. Also see this recent discussion of the EEStor story in the Energy Blog. Here is the latest update from ZENN Motor. With Head Office in Toronto, Canada, ZENN Motor Company is dedicated to being the global leader in producing zero emission transportation solutions for markets around the world. Our current ZENNTM car is the perfect vehicle for urban commuters, fleets (such as resorts, gated communities, airports, college and business campuses, municipalities, parks and more), the environmentally conscious driver, and consumers who just want to save money. The ZENNTM is sold through a growing network of retailers across the United States. The ZENNTM is a fully electric low speed vehicle (LSV) with European styling and appointments that offers customers tremendous operational cost savings compared to a vehicle powered by an internal combustion engine. Named "Best Urban Vehicle" at the 2006 Michelin Bibendum Challenge, the ZENNTM performed exceptionally well in all categories including excellent overall design, acceleration, braking, lowest power consumption and lowest noise level. The potential commercialization of the high power-density ceramic ultra capacitor being developed by the Company's strategic partner, EEStor Inc. for future ZENNTM vehicles will enable them to travel greater speeds and distances like a traditional car at a fraction of the cost. Moreover, ZENN electric vehicles won't emit emissions or noise pollution and will provide their owners a freedom from worrying about escalating gas prices - making widespread concerns about oil dependency a thing of the past. One thing that always seems to be glossed over in almost all electric car initiatives is cabin heat. This is most particular in the case of a Canadian vehicle, it cannot have escaped the notice of any firm based in Toronto that the winters up here are harsh and cabin heat is not a luxury. Electric heaters are available as an option on the ZENN however there is scant data on how much of an impact running it will have on range or top speed. This is not an insurmountable issue for electric cars. One power cell called the Zebra battery runs at elevated temperatures being of the molten salt design. Wast heat from its operation could be used for cabin heat with less of an impact on energy drain than resistance heat. Zebra batteries are a relatively mature technology as a Google search will show. At any rate this issue of heating will have to be addressed if electric cars are going to be practical in the northern U.S. and Canada. Air conditioning is an even bigger issue in Texas. Practical EV's in Texas must have enough reserve electricity to power an air conditioner along with providing motive power for auto trips. (See my discussion on the Air Conditioner test.) I consider the current Zenn vehicle a glorified golf cart. Until recently it could not be sold legally in Canada. I do not regard ZENN as a long term player. 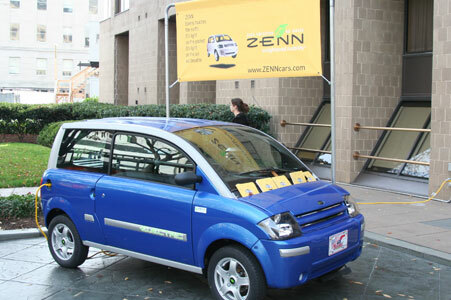 Zenn is owned by Feel Good Cars, a Canadian firm. If EEStor comes through on its commitment to Zenn.Feel good, the next step would be to put the Zenn-EEStor technology on the market for sale to an established auto company. Charles, it is good you follow the development of the EV. Clearly the big hurdle is electric storage (you mention a few) but we have a ways to go. I see us developing "nuclear cars" by the building of reactors to power and charge future storage devices that can move all our transportation, our biggest energy user and our biggest polluter. Developing really long lived (both in charge and actual life) will help bring the onset of a true fission economy. David, 100% Nuclear generated electricity and electrification of transportation = 3/4 of the CO2 we need to git rid of. A vehicle that does not offer significant utility and value advantages over those which exist already will fail. They are, after all, the competition. If you wish to develop a vehicle that competes on equal terms in the market, then you need more range and superior performance to what is available already. Here's the rub, you need to anticipate what range and performace will be available at the time your vehicle is released to the public. That means that you are likely looking ten years ahead or more. Trying to divine what'll be around then is a difficult proposition. Still, what we do know is that the ICE has plenty of development potential left yet. For instance, Mercedes have an engine on test which will allow 60 mpg and no loss of performance from a luxury car. Assuming tank size remains constant, the range is going to be impressive. Perhaps the owner will ony need fuel up the car on a monthly basis instead of weekly as he does now. Fiat are presently working on sub 1000cc engines that perform as well as current 2-litre designs. They are chasing 100mpg with no loss of utility or performance. Vehicles featuring such engines will be lauched in under 5 years. It is go increasingly difficult to work out what will be around in ten years.... and even harder to compete. Electrics and fuel cells are nowhere near ready yet. The expectation must be that some form of chemical fuel will continue to predominate (and it will not be H2).